Those with a barn filled with pitchforks and unlit torches may want to start gathering your angry mob parties … the Xbox Live Marketplace is experiencing an outage. We're not going to commit to the notion that this is another hack put on by a group or an individual; but, in light of all that's gone on with the PlayStation Network, it's hard to not get riled up once a gaming network experiences an outage of any kind. 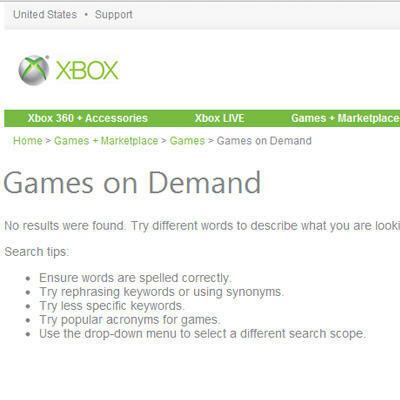 This time around, the Xbox 360 is not properly accessing the Marketplace section of its Xbox LIVE service. Users can go into the Marketplace, but once they look under a specific category where a host of games should appear the console reports that there's no available content. The image on the right is the current view from the Games on Demand section of the Xbox.com portal. Microsoft is aware of the problem and offered up some information to VG247 when asked. …We are aware of the problem and are working to resolve the issue. We apologize for any inconvenience this may cause and thank you for your patience." As VG247 was quick to point out, Xbox LIVE itself is not down. You can still chat with friends and play games. You cannot, however, buy new content. This feels like a problem set upon a much smaller scale than what's been going on with the PlayStation Network. We'll hand the soapboxes over to you, dear readers, as we incite the obvious discussion at hand. Does this incident in any way compare to what's been happening to Sony? What does it say about Microsoft?